I have been doing good chili with meat & beans for a lot of years but never wrote down my recipe until now. 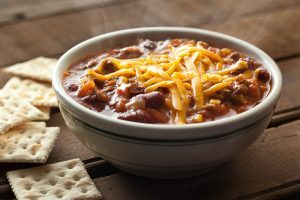 Chili has always been one those dishes that just not too fussy, most leftovers work too. 1 lbs. ground beef, or or pork or left over brisket or skit steak or carne asada ..it’s all good. In a 12-inch nonstick skillet over medium, heat the oil until barely smoking. Add the ground beef, garlic, chilies and onion, then stir, cover and cook, stirring occasionally, until the vegetables are tender and the onions are well browned, ~10 minutes. In a large pot on medium heat, add the beans, tomatoes, tomato paste, beer or water,cilantro, oregano, garlic powder, Tajin and Adobo spices and catsup. Mix well. Add meat mix from skillet (drain excess oil first if needed). Mix well with ingredients and slowly bring pot to a boil. You may add water to get the right consistency. Once it reaches a boil, reduce heat to simmer and cover. Stir the chili occasionally and cooking until the beans are soft (~ 1- 1.5 hours). The Chili is done when the beans are soft. Stir in vinegar right at the end to perk things up a tad. Taste one more time for salt and pepper. Fill bowls with chili, garnish with Cheddar/Monterey Jack cheese and scallions. Some folks even like sour cream on theirs. Crackers or better yet .. some nice hot corn bread with your favorite cold drink. That’s at least one form of heaven!